Focus on Customer Delight to Connect - InsideOut Solutions, Inc.
Prioritize Customer Delight as a Principle of Inbound Marketing. At InsideOut Solutions, we want to give strong guidance to our own clients about how to consistently and carefully nurture those guests who have come and gone. Just because a guest has paid the bill and left doesn’t mean that the relationship stops there. In fact, it’s quite typical that guests who visit a bed & breakfast or a dude ranch might, in fact, be looking to return. Old-fashioned, outbound marketing focused very much on making the product sale and then leaving the customer in the cold. But inbound marketing at its very core seeks to engage in a relationship, to connect, and then foster that over time. Which is why instead of inbound marketing (which is a fine term in and of itself), InsideOut Solutions’ prefers “connection marketing.” That’s what inbound marketing is all about: connection. Great. So what’s the point of aiming to delight? Glad you asked. Ever heard of a company called Apple? If you have, you can probably name at least two – if not all – of the products they sell. Part of the reason for Apple’s success is that they not only market well, but that they aim for customer delight. In the recent Apple announcement on October 16th, the company shared that its iPad Mini Retina has attained a 100% customer satisfaction rating, besides the iPad product line itself consistently ranking #1 in customer satisfaction. Numbers don’t necessarily mean everything, but this is an indicator that Apple isn’t just doing something right with its product, but is doing something right for its customer. The product could be absolutely amazing in its own right. But without an aim to delight the customer, the product would be useless. 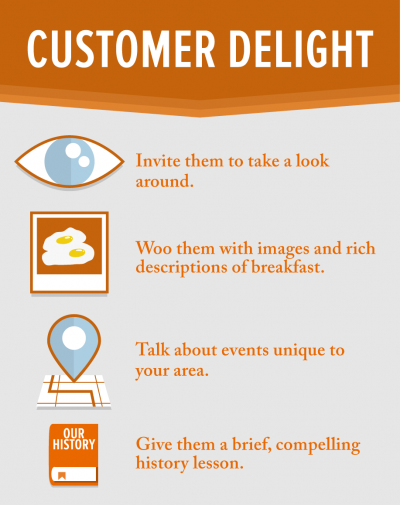 Make your primary goal to delight your guests because that’s what will draw them to you. Customer delight goes all the way back to “attract” or, for our purposes, “invite.” You start the relationship dialogue when you invite a potential guest to your site. At that moment, you should begin to delight them, even before they’ve booked a room, even before they’ve checked for availability. Now think about what will delight a guest who might choose your bed and breakfast. Is it the fact that your inn is $20/night cheaper than other nearby B&B’s in the area? Maybe. But it’s more likely that what will delight them is the experiences you offer there. Think about customer delight not as the “final phase” in inbound marketing. Instead, consider it the driving phase of the whole inbound marketing process. Your content, email, and social media marketing efforts should all focus on customer delight. 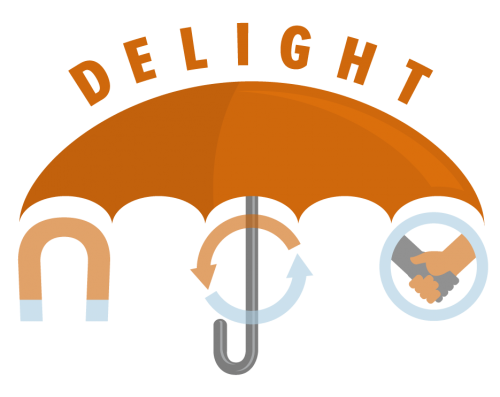 Delight really is the overarching principle that makes inbound marketing so different from outbound marketing. In fact, you wouldn’t go wrong if you knew nothing about inbound marketing, but pursued the single goal of delighting individuals across the board. When inbound marketing is done right and the aim is to delight the customer, that you will not only have repeat and loyal customers, but you’ll also have gained a team of unpaid, word-of-mouth advocates. Invite them to take a look around: In the lodging industry, beautiful photographs are worth more than just a thousand words. They can be the final factor in gaining a guest. The internet has a provided a level playing field — to some degree — for individuals to engage users at a visual level. A gorgeous collection of photos that show your destination at all seasons of the year, or with beautiful sunrises or sunsets, or any other theme, could very well be the deciding factor. As a site visitor decides to book with you, demonstrate that you intend to delight them by using photos to show them the experience they could have when staying with you. Woo them with images and rich descriptions of breakfast: I do not mean post smartphone pics of a breakfast. I mean, carefully photograph a full place-setting, capturing the steam rising from freshly prepared food, the glistening of co-mingled syrup and butter atop lightly browned pancakes, and a cold glass of milk or orange juice sitting to the side. Don’t just take a picture of a muffin and a cup of coffee, and tell your potential guests to trust you, that your breakfast is top-notch. I wouldn’t buy that. Neither would they. And don’t get all weird and formal about your breakfast. “We serve a good breakfast that is complete with all recommended nutritional elements.” Boring. Instead, delight them with terminology that invigorates their senses. Talk about the sizzling of bacon and sausage in the pan, the light and fluffy omelette made fresh, the enticing earthy scent of a hearty, dark roast coffee, or the fresh, fruit that bursts with sugary goodness in the mouth. Enrich the breakfast before the guest has even decided that’s part of the desired experience. Give them a brief, compelling history lesson: One of the interesting aspects of bed and breakfasts, for example, is their often storied history. How the houses came about, who built them, their namesakes, and their gradual expansions often make for interesting lore to individuals who seek out the classic charm associated with those types of destinations. And when you do go about describing the history, try not to make it like reading a history written on parchment in the Middle Ages. Enrich it with human narrative. Make it something interesting to read. Show your friends and ask them what you might do to improve its appeal. All this talk about customer delight, but you might wondering how to actually make this practical. This is where we build on tools and tactics discussed in previous posts: email marketing, content marketing, and social media marketing. Your website is a great commonplace for prospective guests and returning guests alike. Blog posts are a solid method for generating draw and attention. But the ways I mentioned to delight your guests are best when doled out to individuals you’ve recognized as leads, or to former guests who already subscribe to what you offer. Email Marketing: While a solid method for “closing the sale,” email marketing is also a method of sending appropriately tailored content to guests who have left your inn. Create new connections with leads, and maintain connections with former guests because it increases the chances of a return visit. Content Marketing: Think of content marketing as the substance you’re using to invite and delight prospective and former guests. Social Media Marketing: Put yourself out there. Social media is where a lot of conversations are now taking place. The various channels (Facebook, Google+, Twitter, etc.) are places where people are exchanging ideas, talking about brands and companies, and learning from one another. As we continue to post on topics relating to connection marketing, we’ll be digging deeper into these various types of marketing and how to use them in the hospitality industry. Whatever form of marketing best fits your goals to delight your prospective, current, and former guests, be sure that you approach everything you do with care. If you don’t care, you’re missing out on the primary ingredient for succeeding in what you do. Gone are the days of cold sales and harsh tactics meant to bully people into buying products. We are in a new era of inbound marketing that is truly customer-centric and it is the customers themselves who have shaped this new era. If you’d like social media alerts of when we publish our next post, join us on Facebook, Twitter, Google+, Pinterest, and LinkedIn. Or, if you have an RSS reader, click to subscribe to our blog. Currently, InsideOut Solutions offers blogging and email marketing services to help you improve your inbound marketing efforts. Click below to contact us and find out more about these services.